I am enjoying participating in this series from Aona at ttpw.gouldgeneogy.com/2012/05/take-the-family-history-through-the-alphabet-challenge. Circumstances mean I am running behind, so here somewhat belatedly is my contribution on W.
Weddings - always one of the most popular topics on my blog and it is difficult to select one image. Have a look at Century of Wedding Belles for an overview. A wedding of 1910 form the collection of my cousin Stuart. Wills - Quite early on in my research, I was delighted to trace through the Index at Lancashire Record Office two wills relating to my Danson ancestors. 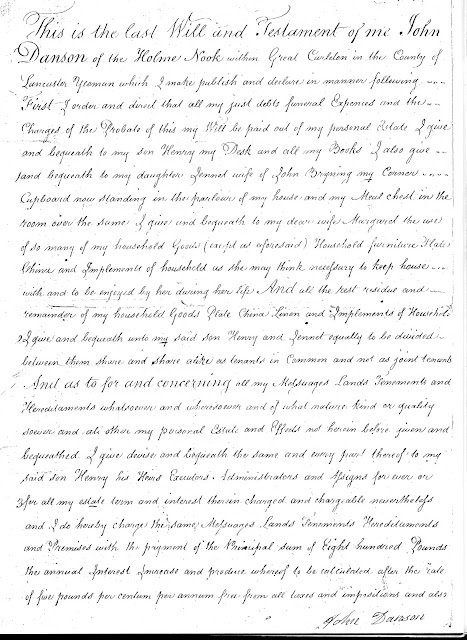 These documents not only gave information on children and grandchildren, including the married name of daughters - some unknown to me previously, but also cast a light on what were considered important possessions at the time, with a feather bed, sheets and bedstead, desk and books, meal chests and corner cupboard - all items of personal value cited in the wills. 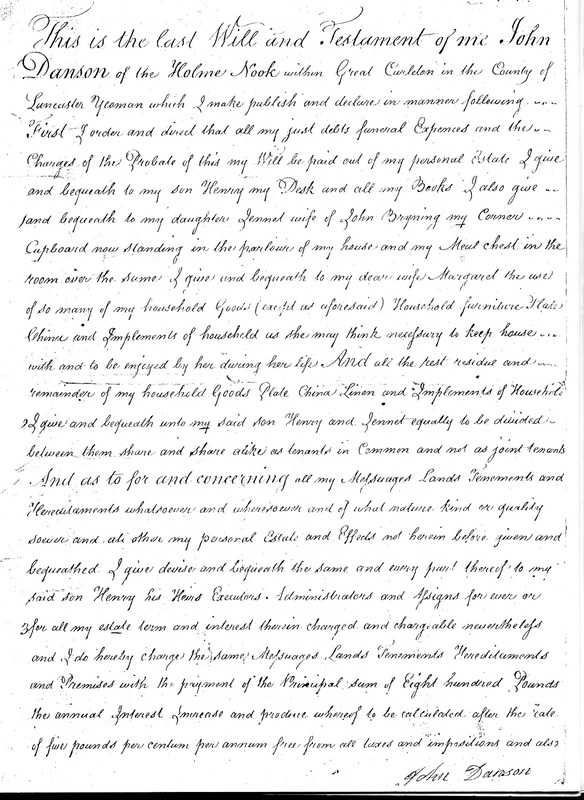 So if you are lucky to trace a will, you have a unique resource which can add so much to your family history story. War and War \Memorials - as we move into the month of November, we think of Remembrance Day and the role our ancestors played in warfare. I have been proud on my blog to pay tribute to relations who fought, to feature the records I have found on them and the moving war memorials around the world that remember their sacrifice. 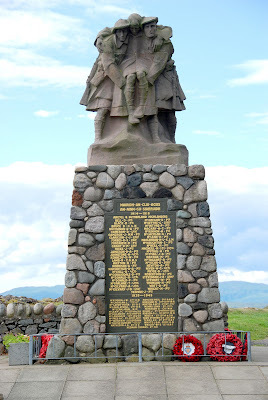 The War Memorial at Oban on the west coast of Scotland, with the hills of the Isle of Mull in the background. 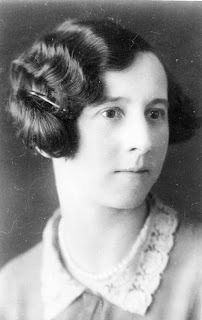 On my "to do" list is Elizabeth Brekall, the second wife of my great great grandfather Robert Rawliffe. He was widowed with five surviving daughters, and married 35 year old Elizabeth Brekall, 20 years his junior. As she had three children of her own, I assumed she was also widowed. Wrong! According to the marriage certificate (and earlier census returns), Elizabeth was a spinster and the children were illegitimate. She went onto have a further four children with Robert. Work - our ancestors worked long hours with very little time off. This makes it especially important to gain an understanding of their occupations and there is a wealth of information out there to give colour to a simple job title in a census entry. 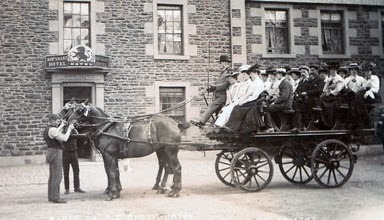 In my Danson family, as the 19thcentury progressed, family life changed from one based around the land - iinstead of yeomen, husbandmen, farmers, carters and agricultural labourers, life became more urban and other occupations began to appear in the records such as railway porter, engine cleaner and pointsman - and even a tripe dealer! My husband's Donaldson ancestors had sea connections whether as a mariner, shipwright, caulker, or river policeman. Another branch were miners moving between Derbyshire, Yorkshire and County Durham. Left is an advertising blotter promoting the hairdressing business "Elise" of my mother's second cousin, Elsie . Worship - finding out where our ancestors wworshipped, were baptised, married and buried is perhaps one of the first stages of our family history research. 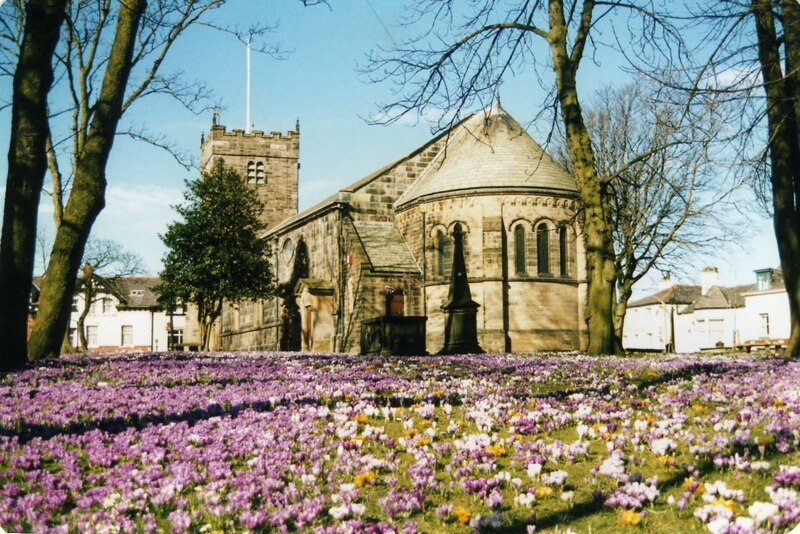 St Chad's Church, Poulton-le-Fylde, Lanxcashire - home of my Danson ancestors. And among all the W's where would we be without the World Wide Web! Absolutely every one of the W words is SOOOOO relevant. The wedding photos are beautiful, and I really love that advertising for 'Elise' the hairdresser, it's gorgeous. Many thanks for your lovely comment - it was a letter full of possiblities as we wind down to XYZ. I especially like that first photo. Those hats are amazing.